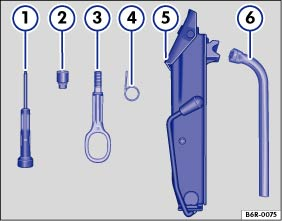 The content of the vehicle toolkit depends on the vehicle equipment level. The following describes the maximum scope. Screwdriver with hexagon socket in the handle for slackened wheel bolts. The screwdriver blade (Torx) is reversible. Adapter for the anti-theft wheel bolts. Volkswagen recommends that you carry the wheel bolt adapter in the vehicle toolkit at all times. The code number of the anti-theft wheel bolt is stamped on the front of the adapter. You will need this number to replace the adapter if lost. Make a note of the code number for the anti-theft wheel bolt and keep it in a safe place – but not inside the vehicle. Wire hook for pulling off the wheel covers and wheel bolt caps. Vehicle jack. Before you return the vehicle jack to the toolbox, fully wind in the claw. To stow the vehicle jack securely the crank lever must be braced against the side of the jack. Box spanner for wheel bolts.